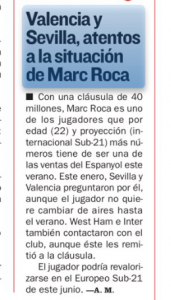 A couple of days ago we covered a report from Spain which claimed West Ham made an official January approach to sign Marc Roca. Inter Milan were also said to be keen, wanting to take the midfielder on loan for the rest of the season, with an option to buy in the summer market. The 22 year old is a regular at Espanyol so they naturally laughed off the Inter offer. When West Ham made their approach, the Premier League club were referred to the player’s buyout clause. That €40m figure seemed to scare the Hammers off for the winter window, and no offer was then made for the player. 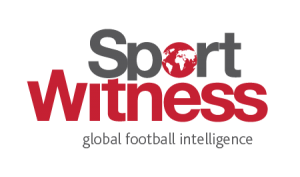 West Ham have been repeatedly scouting Espanyol this season, and a return for the player in the summer shouldn’t be ruled out. Thursday’s edition of AS states Valencia and Sevilla are also interested in the player. Both have asked for him, but the player didn’t want to move before the end of the current season. AS state that Roca can be a big sale for Espanyol in the summer, with a big money transfer presented as likely, the suggestion being the Barcelona side could cash in. West Ham’s approach is also backed up. The question now is just how much will Espanyol accept? It’s unlikely they’ll stick to the €40m amount, unless Roca has an amazing end to the season.